If anything in the universe lends itself to broad, shamanic principles, it is surely entropy. Broken glass, spilled milk, and toppled stacks of books are all examples of that universal principle we are familiar with. At times, it almost seems intelligent, malicious, seeking to thwart our intentions and pervert our efforts to bring order to our lives. 1. You can’t get ahead. 2. You can’t break even. 3. You cannot refuse to play. 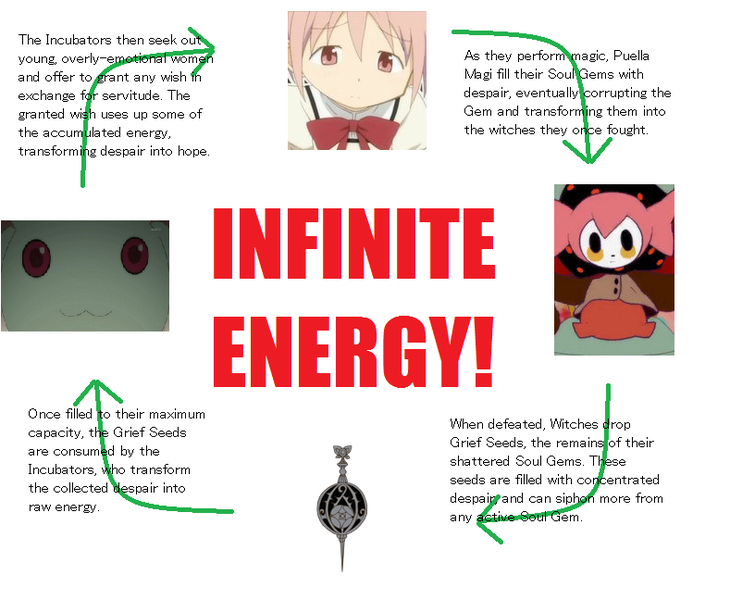 Mahou Shoujo Madoka Magica examines these laws not from a literal standpoint, but from a philosophical standpoint. It is not the first anime to do so – Full Metal Alchemist centered almost entirely on the point of “Equivalent Exchange,” a principle that comes pretty close to the first law of thermodynamics: to receive something, you must give up something of equal value. The primary difference between Madoka and its intellectual predecessor is the degree of adherence to Law Two: in Alchemist, you can get some pretty good trades as well as some pretty bad ones. In Madoka, it’s all downhill, with magical girls ultimately sliding down a slippery slope of magic dependency into outright insanity. In this context, what exactly is Kyuubey? He is the vengeance of entropy, the denial of hope, the cold and cruel insistence that you cannot get something for nothing, and that the house always takes a cut. With Kyuubey you can never truly get what you wish for just by asking for it, for the act of obtaining your wish in such a fashion changes the situation. Furthermore, what you get never quite equals what you give up: it always falls short, usually in some terrible way. It has been variously said that Kyuubey’s explanations of magical energy and entropy border on the laughable, and perhaps that’s right. But ultimately Kyuubey and what he represents should be considered in terms of a philosophical argument, not an accurate, one-to-one correspondence with reality and proper physics. If we ignore this level of consideration to focus on the literal, then Mahou Shoujo Madoka Magica is only the story of a mailed fist punching a defenseless face in the nose, ad nauseam, over the course of a dozen episodes. Including it, we see a marvelous juxtaposition: the futility perceived in adulthood when compared with the unbounded expectations of childhood, is philosophically similar to the ultimate thermodynamic futility of all chemical and physical processes, life included. Water runs downhill, and does not flow back up. People become corrupt, and do not regain their innocence. Everyone dies, in the end. Ultimately Madoka, for all of its bleak and nihilistic scenes, cannot help but be a magical girl show. Even at its worst, it is still in many respects cheerier than the reality the human race lives in. Thermodynamics really does state that we and the world are on a one-way trip to oblivion, and anything we do only hastens the process. While the stories of the girls in the show are sad, examples abound of people whose daily lives are more depressing than those in the show. The truly depressing thing about Madoka isn’t that its fictional characters are subject to horror, death and worse. It’s that every bad thing in Madoka is actually a censored version of what really happens on our planet.